The kiss-off letter begins “Dear Sir or Madam”– the same salutation as CAI’s October 29th surrender the premises letter— which ATZ previously posted. We have to wonder if both letters were drafted by the NYCEDC attorneys or is this type of letter always so generic and coldly impersonal? The letter states that as of the date of this letter “any and all matters regarding your License and the Premises should be addressed with Central Amusement International.” Any license fees and charges. Any notices, inquiries, requests. Any anything. In other words, the City’s done with you, Sir or Madam. Don’t call us, blame us, bother us, ask us for support. After the Boardwalk businesses received the eviction letters on November 1st, City officials–both elected and appointed–tried to distance themselves by referring all questions to the amusement operator. Officials told the business owners it was Zamperla’s decision and there was nothing they could do. The businesses, which had been expecting responses to their business plans, were shocked and dismayed to receive eviction notices instead. In advance of an eviction hearing scheduled for January 10, both sides are expected to get together for talks today. Will there be an out of court settlement? At a previous hearing on December 10, NYCEDC attorneys and a representative of the asset management department were present along with Valerio Ferrari, CEO of Zamperla USA and Central Amusement International. 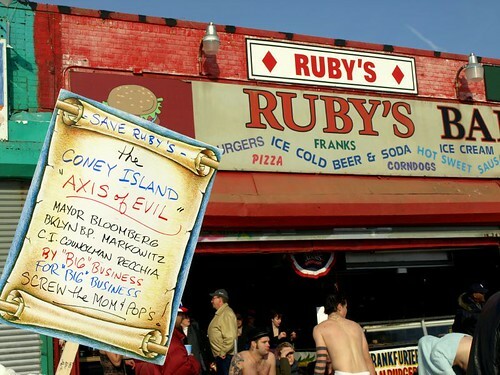 The Coney Island Eight’s new website asks “Who is behind the eviction of the Coney Island 8”? Their answer is that the City made the decision as to who was going to be on the boardwalk long before any proposals were submitted. 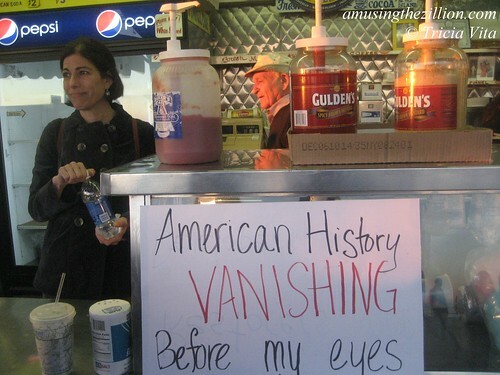 It has been reported that Central Amusements was responsible for the ousting of the Coney Island Boardwalk Businesses. This is not true. The City of New York under the leadership of Mayor Bloomberg are the primary developers of Coney Island. This became evident in meetings with Central Amusements when their top Management explained to the Boardwalk vendors that Mayor Bloomberg met with them and told them that he wanted the Boardwalk to have a fresh look. It was two days before the renewal of leases the owners of the land turned all the leases over to Central Amusements to give the impression that Central Amusements made this decision. Old News but, Court is Today, lets see what happens. Lets see if the settle for the money. If you remember, Mr. Shoot The Freak mentioned in his NY Post article…..”Is there a magic number that could change my mind? Perhaps, but my goal from the beginning has always been to come back. Just that sentence alone tells me what the intentions are here. I can assure you that if they are offered a money settlement they will all go away. And that upsets me because from day one they have been playing off of the sympathy of the public. Lets see what pans out…. Re a money settlement, I think you may have it backwards. I believe it is the City that is offering the money settlement because it is the only thing they can offer. I don’t expect the City/Zamperla to let any of the Coney Island 8 stay because other plans have already been made for those properties. A settlement would compensate the businesses for the costs of those unnecessary “business plans” and to help them relocate in Coney or elsewhere. Who to believe in the press? The village voice? The NY Post? The one thing that you all miss is the amount of publicity they are getting. What to do with that is another. That’s how u succeed in business. This is a win win situation no matter how you slice it up! Pauls Daughter is the only business I have any sympathy for. The family is a class act and what they did for the community on the last day they opened showed me that. Everything was FREE!